Providing multi-day backup power at all transmitters reduces service calls and improves network reliability significantly. On many WISP networks, power disruption is the leading cause of client outages. Most off-the-shelf retail UPS units (eg. APC1100) have very limited run time for their size. They are designed to provide computers with high wattage, short term power while they are shut down during a power outage. What a wireless site needs is low wattage, but exceptionally long run times. In order to obtain monitored long-runtime UPS from vendors like APC, one would have to invest in enterprise UPS products which are typically thousands of dollars and take up significant amounts of space, and will intentionally shut down when operated below freezing. They are also designed for high wattage applications which raises the cost and space requirements significantly. Typical tower sites have exceptionally low power draw, but require long run times. Computer UPS units are simply not designed for this application. If there is a power failure at a remote location on a Friday night at 10PM it is of great business utility and savings to fix the issue on the following Monday, during business hours. Often by then, the cause of the outage has been resolved by the power utility or landlord and no site visit with a generator is required. 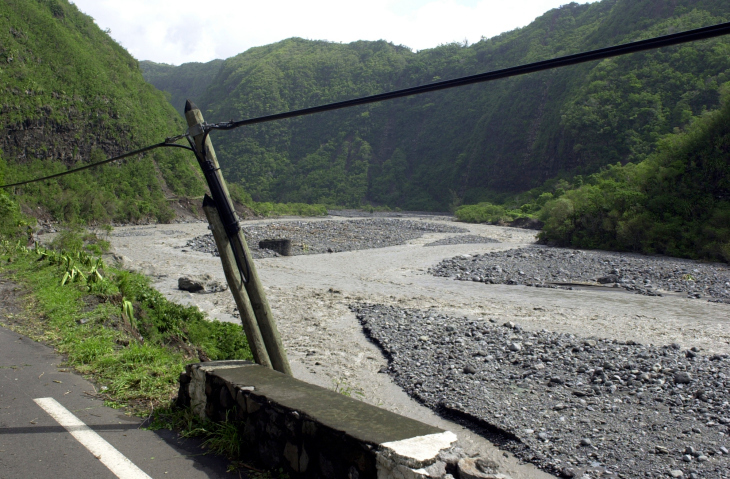 Also, if there are widespread power outages due to acts of nature, it is not uncommon to have several sites lose power and road access closed by emergency services or impassable roads. If six sites all lost power, most WISPs do not have enough generators to get the network back online. Having extended run time power supply can keep the entire network operating for days until roads are reopened and utilities have repaired downed power lines, all while you sit in your warm office! Through many years of experimentation with ISPs all over North America, we have found a solution that is very robust, low cost, works with all devices and technologies (current and future), runs for days (or weeks), and is simple enough to build that even apprentices can install it. It provides low wattage (max 750watts) power for long periods, perfectly suited to WISPs. We have experimented with DC based systems operating at 12, 24 or 48 volts. These systems do work exceptionally well and also have run times that can be days or weeks. However they are much more complex which means that apprentice technicians have great difficulty installing and supporting them. It is very frustrating to have an apprentice technician out at a remote site, trying to restore service who has difficulty understanding how the system works. An engineer has has to be roused from bed and sent out to the site to troubleshoot the issue adding hours onto the repair times and additional labour costs. DC systems also require specialized converters and POE injectors that are not readily available, are expensive and since POEs are often the first device to fail, can become expensive to replace. New devices may be designed in the future that need additional specialized converters. The Airfiber24 was an example of this, for a long time there were no DC based POE injectors available for it, and even now that there are, they are quite expensive. A DC based system also needs specialized battery chargers and remote DC power management devices. All devices support 120v AC out of the box, no need for custom adapters. All devices in the future will support 120v AC at release. Devices not designed for DC operation (like many non-DC Cisco Routers) can be installed. Power managers are easy to obtain at lower cost. One can run a laptop from the system while you are on-site during an outage. The system is the simplest to install, with minimal training, even a junior installer can install it or replace it. It is often much cheaper than a DC based system. The primary downside to an AC based system is that the run times are a bit shorter than DC based systems, but this can be resolved by adding an additional inexpensive battery where run times are still far longer than using PC style UPS units. It retails for about $300 from online retailers. It has a built in inverter that converts the 12v DC from the batteries into 120v AC during a power failure and has a charger that will automatically recharge the battery bank when power is restored. The APS750 is a robust device that works well in a wide range of temperatures. We have deployed them for many years in environments as varied as Arctic Canada to the Mojave Desert without any extra climate control. It is designed to be connected to a bank of off-the-shelf deep-cycle batteries that can give it amp/hour capacities from 100AH to in excess of 700AH. To compare, a typical computer UPS (APC 1100) only has about 20AH of capacity. How many batteries are connected to the unit. What the load on the system is (How many access points, routers and devices are in use). To determine the estimated minimum run time of your system, first measure the wattage load of the site. We use this unit: http://www.homedepot.com/p/Kill-A-Watt-Electricity-Monitor-P4400/202196386 or a watt meter. Do not use the specifications from the hardware manufacturers, it is maximum value for CSA/UL approval and actual power draw is usually much lower. A smallish site with a two backhauls, a small router, and two sectors might commonly draw less than 50 watts. 50 watts at 120V is about .4 Amps. If we have two 100AH batteries (=200AH or 2400W/hrs), we should be able to run about 48 hours (2 days) if we had 100% efficiency. It is important to account for inefficiency to get a more accurate estimate of run time. Under ideal conditions, the inverter is about 80% efficient. We prefer to be more conservative than that to account for the fact the these systems usually operate under less than ideal conditions and efficiency ratings are based on room temperature (the batteries are rather sensitive to capacity based on their temperature). It is easiest to just assume 50% efficiency. Derating for 50% efficiency gives a minimum run time of eight days with a 50 watt load. Actual run time can only be determined by actually building and running the system, but these calculations give us an idea of what to expect. Also keep in mind that if you are in a cold climate, batteries can lose over 50% of their capacity when they are very cold. In winter we further cut run time estimates by another 50% unless the batteries are in a heated space. At another busier site, one might see about 400W of load. If we still have two 100AH batteries in the system, assume about 6 hours of run time. Each battery added would give another ~3 hours of run time. If it was the middle of winter and -30 degrees, we would be pleased to see 1.5 hours of run time. This is really a worst case scenario. In real world use we have seen over 8 hours in summer with 400W load and two 100AH batteries. (**) With a 25 watt load we have experienced well over 3 days of run time under ideal conditions. At the end of the day, one can build a backup solution for under $800 that will run for 1~10 days, depending on batteries and load using these units. How long it takes to charge depends on the model, the number of batteries you connect to it, and the ambient temperature. The charger has a 20amp capacity and typical deep cycle batteries are about 100AH. We usually use two at each site. So with 200AH and 20A of charging capacity, we would expect it to take a minimum of ten hours. However, batteries are not 100% efficient when charging and ambient temperature also affects charge times, so estimate a charge time of ten to twenty hours. Basically, for each 100AH battery, add another five to ten hours of charge time. We have run up to seven batteries on a single unit and there is no limit to the number of batteries one could add, however at a certain point, recharge times become very long. If we had ten batteries we would need to assume up to 100 hours (4 days, possibly longer) for total recharge. This would also give a run time of many many weeks on a smaller site. When selecting deep cycle batteries to use, it is ideal to obtain those locally. Shipping costs of buying batteries online can be very large as they are exceptionally heavy. Ensure they are not automotive batteries. If they have a CCA or “Cold Cranking Amps” rating, do not buy these batteries unless they are specifically “Deep Cycle” and have an AH rating indicated on them. They are designed for starting engines, not for long running times. Look for the Amp/Hour rating. It should be about 80-120AH for most models. The battery will also say “Deep Cycle” or “Deep Discharge” or sometimes “Marine”. The two main types of deep cycle batteries to use are flooded or sealed (gel) cells. Generally we use sealed cells at sites that were more remote but cheaper flooded cells at easy to work on locations. A typical setup with 2 batteries will need 3-4 of these cables. It is important to have a way to be notified when the grid power fails and the site is running on backup power. That way you have a few days notice before having to go out with the generator or electrician. 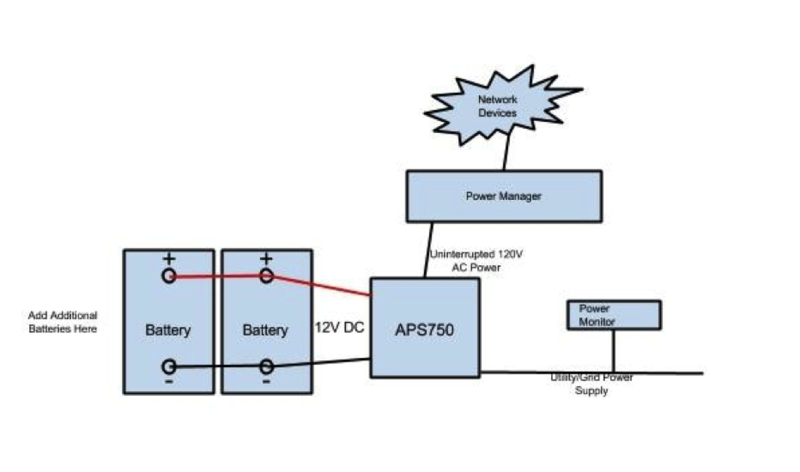 There are many advanced products on the market that allow remote monitoring of the grid (utility power) voltage and battery voltage and power consumption. These can provide very nice info, but in most deployments are overkill. For most sites, simply knowing if there is a power failure is enough information. The simplest way to monitor if utility power is operational is to plug in a low cost IP based device directly into grid power and monitor it, such as what we have at Swift Fox. When grid power fails, the device will shut down and Swift Fox will detect that and generate an outage alert/page. Some devices we have used in the past are older client CPEs like the Bullet5 or LS5, or a simple home router. We simply went into our bin of old equipment and grabbed something small that could have an IP bound to it and could be plugged into the network. For a power manager, we recommend the Digital Loggers Web Power Switch. It is robust, low cost and works exceptionally well. It is also rather compact. To add additional outlets, we add 3-way power splitters and will put up to 3 devices on each port. Starting a WISP Step 2 - Wholesale Internet Access: How it works, How to get it. Copyright © 2018 Swift Fox. All rights reserved. Size of ISP No subscribers (new startup) 1+ subscribers 100+ subscribers 1000+ subscribers 10,000+ subscribers This will help us arrange the right support engineers to get you set up. We've received your request and will be in touch within 1-2 business days to set up a live personal walkthrough of the Swift Fox system with an account manager.